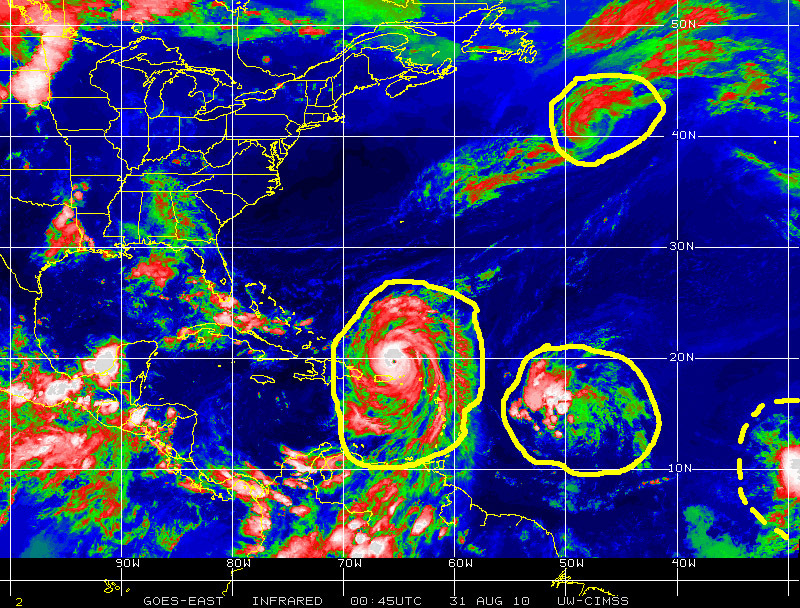 Two hurricanes, one of them a category 4, four tropical storms and at least six tropical waves are currently active in the northern tropics fulfilling our earlier assessment that the ‘tropics are hot’ and things are happening quite fast in the tropics. 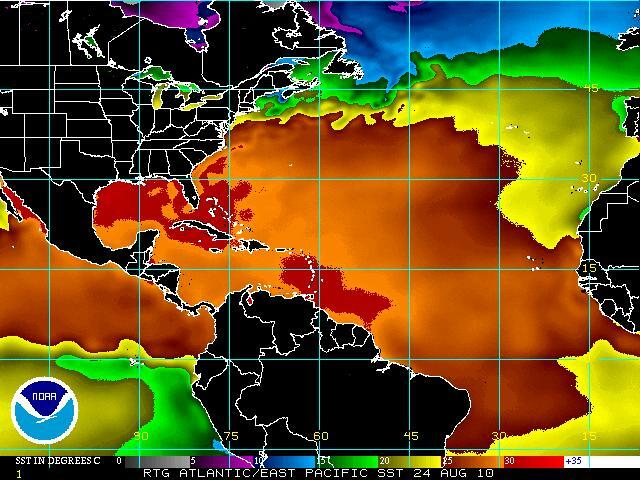 It would appear the 2010 Atlantic hurricane season has suddenly entered a whole higher level of activity after a slow start. Based on the systems currently active and what already appears in the horizon looking east from the Atlantic over equatorial Africa and the Indian ocean, it appears September is gearing up for a new level of tropical cyclone activity. Color-enhanced infrared GOES satellite view showing Tropical Storm Gabrielle to the soueast of Newfounland, category 4 Hurricane Earl just north of the Virgin Islands and Puerto Rico, Tropical Storm Fiona aiming for the Leeward Islands, and over to the far right a tropical wave riding along hurricane alley.Color-enhanced infrared satellite view of the eastern Atlantic and equatorial Africa showing at least five tropical waves moving westward toward hurricane alley on 30 August 2010. A wider view shows additional tropical activity extending into the Indian Ocean as far back as Indonesia and over into the western Pacific where Typhoon KOMPASU is a category 2 tropical cyclone over the southwestern Ryukyu Islands of Japan, and tropical storms LIONROCK and NAMTHEUN are respectively south of the Ryukyu islands near Taiwan and southwest of Taiwan moving for landfall in mainland China. The composite Global Mosaic below shows a good part of such tropical cyclone activity over the Atlantic, Equatorial Africa and the Indian Ocean. Global Mosaic, a composite of several satellite pictures, shows tropical cyclone activity and tropical waves over the Atlantic, equatorial Africa and the Indian Ocean. There is plenty of 'tropical fuel' to feed the 'tropical wave assembly line' over equatorial Africa and 'hurricane alley' in the tropical north Atlantic for at least the next two weeks. The ‘belt’ of tropical weather circling the Earth just north of the equator appears to be firmly in place and fueled by enough activity to last for several days into September. 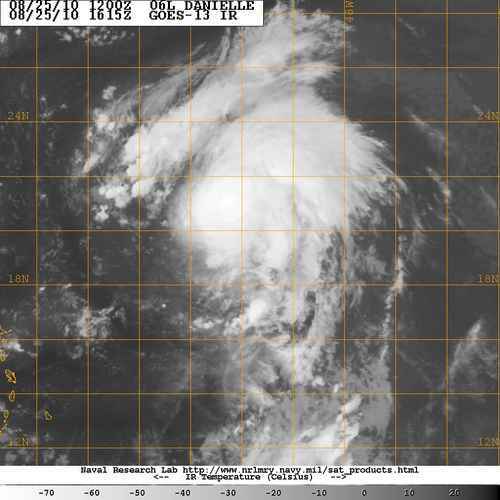 It is interesting to note that two of the currently active systems, Danielle and Earl have both reached category 4 strength, Hurricane Earl went from category 1 to 4 in the span of one day, and Tropical Storm Fiona went from a tropical wave to tropical storm strength in one continuous spur of activity earlier today 30 August 2010. It is clear that conditions overland in tropical equatorial Africa and in the coupled ocean-atmosphere Atlantic environment continue to be favorable for tropical cyclone development and rapid strengthening of new storms. 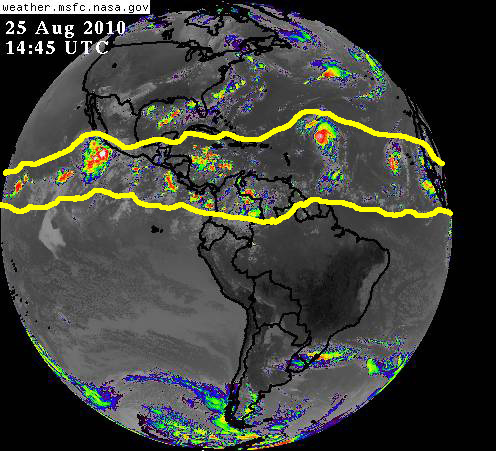 Full disk satellite view of Earth's western hemisphere, on 30 August 2010, showing the belt of tropical weather activity just north of the equator that has been in place for several weeks now.